Condition New Manufacturer Part No. Office 2003 Editions can help organizations and their employees transform information into impact. New and familiar products, features, and functionality improve how people and organizations connect to people, information, and business processes. Advances in intranet collaboration through integration with the collaboration and information-sharing portal, Microsoft Office SharePoint Portal Server 2003, enable employees to access and share information both internally and externally. Support for information rights management (IRM) and industry-standard Extensible Markup Language (XML) provide a platform on which to quickly build cost-effective solutions that can have an immediate impact. This Edition includes the core Office programs: Word 2003, Excel 2003 and Outlook 2003!! Includes OEM COA Only in a Custom Plastic Package with Unique and Unregistered Product Key Number for Activation and Registration!! A Microsoft® 'standalone COA' is supplied as a 'COA only.' 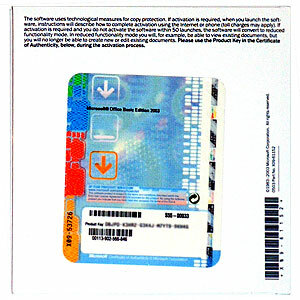 If your intent is to use it as a valid End-User License please obtain your own legal opinions as to the validity. We assume no liability from any consequences arising from your decision. Marketing Information: Office 2003 Basic Edition can help organizations and their employees transform information into impact. New and familiar products, Features, and functionality improve how people and organizations connect to people information, and business processes. Features & benefits: Improvements were made in four areas: Information management and control, business processes communication and Collaboration, and personal productivity. Microsoft Office Outlook 2003 has been significantly redesigned to make it easier to read and organize E-mail messages. Highlights, include a larger viewing area that fits more of The message and decreases scrolling. New Outlook 2003 tools will organize messages by The criteria you choose and compress long threads of E-mail conversations. Outlook 2003 Includes intelligent connectivity and cached mode to allow Users to check their E-mail On The go, while providing a more consistent experience across The range of today's networks and data connections. Office 2003 Editions allow you to create and analyze XML (extensible markup language) Supported content, which can lead to powerful New Solutions for improved business processes. XML in Office 2003 Editions allow for a New level of workflow within files. It also can be used to simplify Day-to-Day use and processing of information from multiple sources, thus reducing redundancy and error. Developers and power Users can develop Solutions that take advantage of The familiar office Interface and tools. Two New Features include The Microsoft Office Excel 2003 Visual design tool which enables The creation of XML schemas without code, and data-bound web parts, which enable information from a web site to be displayed in a File. XML support allows for research in Internal and external data sources. Each Microsoft Office application will include a task pane that can search behind a corporate Firewall and On The Internet depending On The Administrator's choice. Note: In all Office 2003 Editions, Word 2003 documents and Excel 2003 spreadsheets can be saved in a native XML File Format which can be manipulated and searched Using any program that can process, Industry Standard XML. With Microsoft office Professional Edition 2003, companies can also use customized XML formats or schemas to enable easier and more Advanced information creation, Capture Exchange, and reuse. Office 2003 Editions paired with Microsoft Windows Sharepoint Services provide a platform for collaborative document authoring. Microsoft Office files will have a task bar showing Details, such as where to retrieve a File from a Microsoft Office Sharepoint Portal Server 2003 web site, who Is working On The document, tasks, and where to find relevant links and more information. E-mail files as, Live. A, Live attachment, allows each author to Track The changes of all contributors in Real time. Instant messaging (im) in Office 2003 Editions files let Users communicate with each other instantly, without having to Open Up Outlook 2003 or leave The application you are Using. Meeting Workspace, another Windows Sharepoint Services Service provides a workspace that helps you conduct and then follow Up On meetings. Programs in Office 2003 Editions enable you to place files On The workplace to provide meeting Communications and help to organize, share, and archive information. All New innovations contribute to improved productivity for The individual user. Office 2003 Editions continue to improve On ease-of-use and improved functionality throughout all core applications. It also delivers The traditional Microsoft office Standard of reliability, security, and On-The-go use. Includes OEM COA Only with Unique and Unregistered Product Key Number for Activation and Registration!! Hard Disk usage will vary depending On configuration; custom installation choices May require more or less Hard Disk space. Microsoft Exchange server Is required for certain Advanced functionality in Outlook 2003. Microsoft Windows server 2003 running Windows Sharepoint Services Is required for certain Advanced Collaboration Functionality. See detailed System Requirements for Windows Sharepoint Services On The Windows Server 2003 site. Internet functionality requires dial-Up or Broadband Internet Access provided separately; Local or long-distance charges may apply. Certain inking Features require running Microsoft Office On The Microsoft Windows XP Tablet PC Edition.